My baby girl is officially THREE YEARS OLD as of a week ago Saturday!!!! 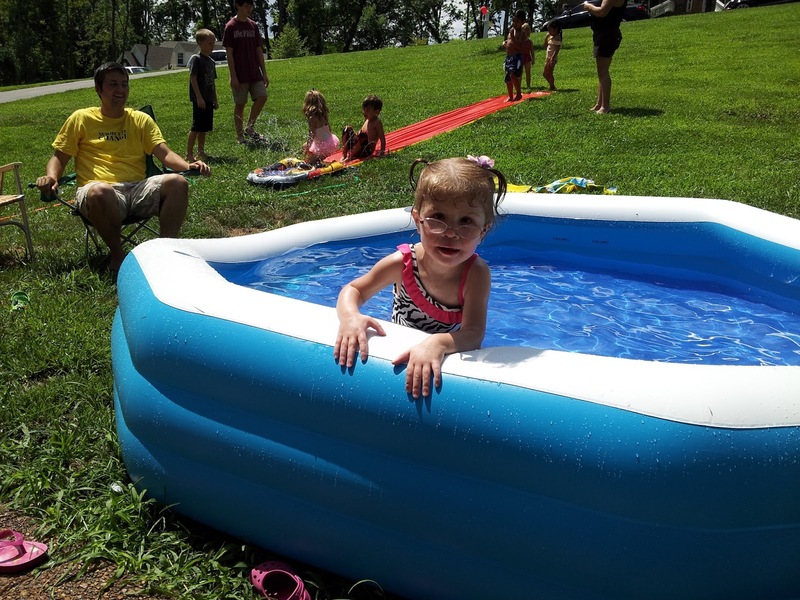 BUT… the special day started off with a fun FIRST for Annabelle! She got to go to another birthday party for a friend! Sweet little Caleb had his birthday party that morning, and Annabelle was invited! They were so sweet to include Annabelle in their celebration as well, and Annabelle had a fabulous time playing outside with her friends in the pool, making a HUGE mess of frosting, and then playing with Caleb’s Thomas the Train gifts he got! Caleb’s Mommy and a few other friends gave Annabelle a few presents too, MINNIE Mouse presents! She loved them!! She liked her–very messy– Mickey cupcake w/ red icing! 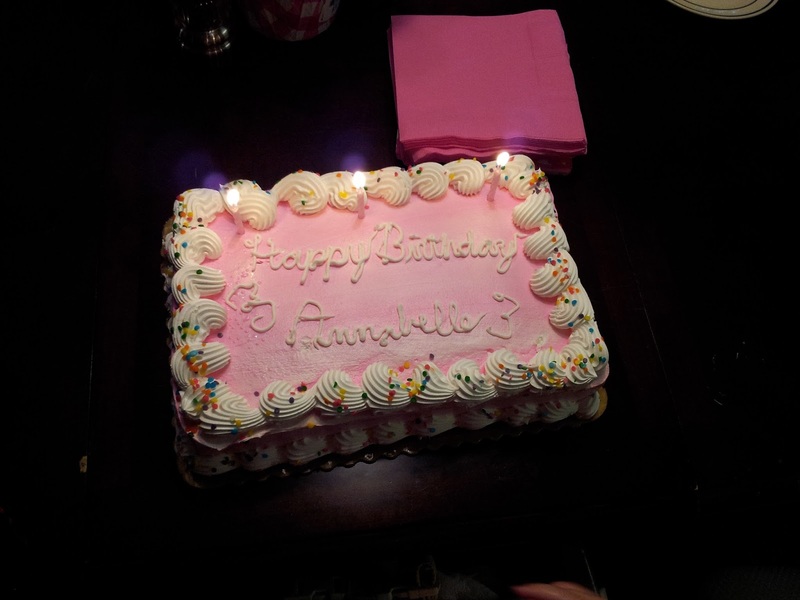 Then of course, it was Annabelle’s turn that evening for HER party. 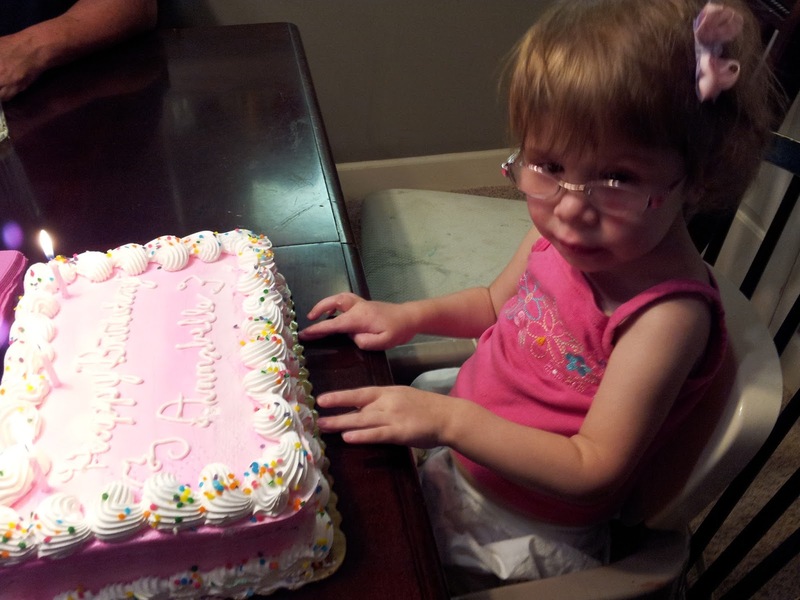 She was a little unsure of her cake. But unfortunately, that turned into utter terror when her sisters helped her blow out the candles. As you can see, the smoke from the candles scared her a wee bit. *sigh* She then hated everything about her cake and screamed when we tried to cut her a piece. Maybe next year she won’t be afraid of her own birthday cake! Instead of cake… she had a blast playing with the giant stack of napkins! And because it was her birthday, Mommy let her go for it!!! But her FAVORITE gift was one that we in zero way could afford but mommy super, super wanted to get her. We took a break from therapy for the summer, which in a TON of ways has been a VERY GOOD thing. With working at least a day a week this summer, on top of a crazy schedule, it’s been so nice to spend the time at HOME with my kids, rather than running back and forth to Nashville for therapy. But one of the big things I missed Annabelle having was her bike. Part of PT every week was our weekly “bike ride” for Annabelle. They have a special adaptive bike that fits her perfect. It allows her to prepel the bike herself using a combination of hand pedals and foot pedals, and has straps for both her feet and her waist, and has a handle for Mommy to push. It is a very big part of her therapy, as it helps strength both her arm and leg muscles. On top of that, every little girl needs to be able to ride a bike!! But this adaptive bike is VERY expensive. I’d posted a note on Facebook that I’d effectively marked this off of the list as a birthday gift given the $$$ price that was way out of our budget. A few minutes later, I got a message from a heart-momma friend of mine. 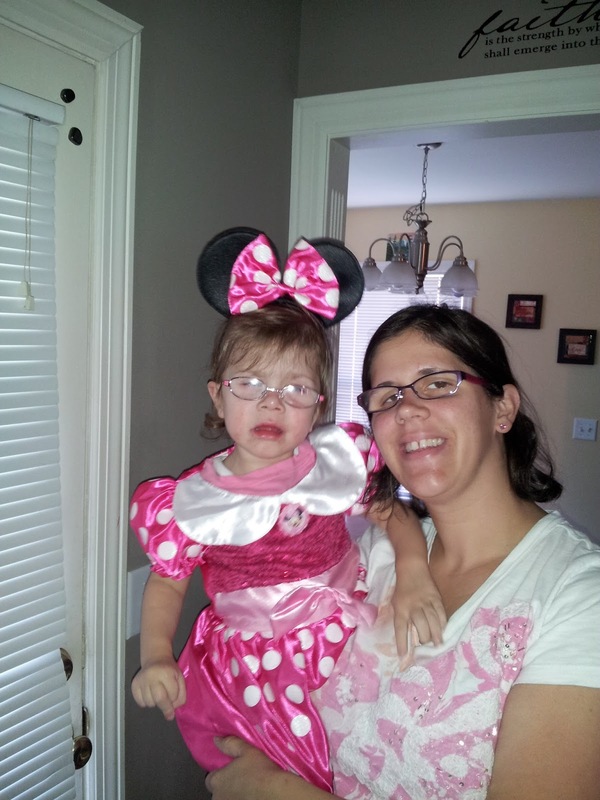 She lost her sweet little Haley to a heart defect in August of 2010. Just 2 weeks after Annabelle was born, just two hospital rooms down from where Annabelle fought for her life at the same time. Haley’s Momma started Haley’s Heart Foundation in her honor, hoping to help heart families and fellow heart warriors. She told me that when she saw my post, she felt God telling her to get Annabelle her bike! I was MORE than a little blown away. While a bike seems like such a little thing, it is a BIG, HUGE thing to me, and obviously to sweet princess Annabelle! It helps build my sweet girl’s muscles in a way that can be FUN. Instead of taking wagon rides where she just sits there, she can actually RIDE around the neighborhood with us and get the exercise she needs to grow STRONG. YES! This is so much FUN! Watch out world… here I come!! I am still overwhelmed at Tina’s thoughtfulness and am truly speechless. I know many other families have been impacted by Haley’s Heart Foundation, and she just has such a fabulous heart. Last year, I organized Annabelle’s Birthday Blessings to help sweet babies struggling in the hospital. The response was FABULOUS and I can NOT thank everyone enough for participating. And while I’d love to do it again (and may in the future), this year I wanted to support a charity that is already set up and meeting people where they need it most. Tina does something with her foundation that I LOVE LOVE LOVE. She targets specific individual needs of heart families and children, and provides as she is able and as God blesses. If you feel led, please feel free to donate to Haley’s Heart Foundation. They are a 501(c) organization, so your donation will be tax deductible. Nothing would make my heart feel better than to see donations to this great organization in honor of Annabelle and especially, in memory of sweet Haley. This Friday will be the 3rd anniversary of her going home to Jesus. you Haley’s Heart Foundation for the money donation you gave us today. you so much for the donation towards my 3 year old Nathans headstone. And let me take a moment to say, if I hadn’t said it enough… THANK YOU to all my blog readers, for all your support and prayer for my family. They have kept me going on many a bad day, and completely humbled me in the process. Words can not thank you enough.